Southwestern Native American tribal jewelry is synonymous with quality – and rightfully so. Perhaps the most celebrated of all Native American Jewelry is that of the Navajo tribe, with its boldly inscribed silverwork and generously-proportioned nuggets of locally-mined Turquoise. These wonderful pieces are often of impressive size, with large pendants hanging from one or more beaded strands. The Navajo are masters of the Concha and the beautiful Squash Blossom Necklace with its inverted-crescent Naja pendant suspended from a chain rimmed with squash flower buds. The notable Santo Domingo (or Kewa Pueblo) Jewelry is famous for its tiny, precisely made shell-beads called heishi (today the term heishi describes similar beads of any material). Kewa Pueblo heishi is distinguished by its smooth feel when you run it through the fingers. This is because Pueblo carvers buff the outside surfaces of each bead against a turning wheel, shaving away any barbs or irregularities until only a smooth surface remains. Some say that today’s Kewa Pueblo (Santo Domino) Indian Jewelry is the most refined of all the Native American Tribal Jewelry traditions. Meticulously made Zuni Jewelry contains small lozenge-shaped beads arranged in delicate-looking designs, sometimes called “needlepoint.” Silver usually plays a secondary role, since the Zuni prefer working with stone or shell to create patterns that mimic those found in nature. 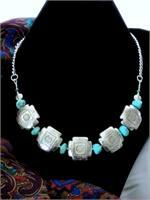 Zuni jewelry is relatively light-weight and painstakingly crafted. The Zuni also produce hand-carved stone animal fetishes and superb channel inlay jewelry. Although the Hopi are among the oldest makers of Native American tribal jewelry in Northern America, they are comparative newcomers to the contemporary Indian tribal jewelry market. Recognized for their precise overlay technique, Hopi jewelry is handcrafted by fusing 2 pieces of silver together so that a cut-out design appears in contrasted relief. Their jewelry is often difficult to find since fewer pieces are made. Since 1999, it is illegal in the USA to claim that a piece of jewelry is Native American Indian Jewelry when it is not. That is why all the Native American Tribal Jewelry pieces on Tribal Muse are certified. Similar-looking pieces that are not so certified are identified as “Southwestern Jewelry” in their descriptions, and not as Native American Indian Jewelry. Thinking About Native American Jewelry? I would love to know your experiences with Native American tribal jewelry and my blog. Share a comment or send an email anytime.